Lee (BAFTA winner Lee Mack) has a problem. His easy-going, comfortable friendship with flatmate Kate (Spooks star Megan Dodds) is steadily moving into uncharted waters - a situation complicated by the fact that Lee's best mate, uptight accountant Tim (fellow BAFTA winner Tim Vine), is Kate's ex-boyfriend. While Lee is unburdened by ambition or drive, drifting form one ill-advised job to another, clean living Californian Kate is determin..
Every episode of the BBC sitcom starring Lee Mack and Tim Vine. Lee (Mack) shares a flat with his best friend, Tim (Vine), but their friendship is complicated by Lee's unrequited love for Tim's sister Lucy (Sally Bretton). The episodes are: 'Serious', 'Death', 'Aussie', 'Stress', 'Kid', 'Caretaker', 'Mortgage', 'Gay', 'The Librarian', 'Baby', 'Art', 'Dating', 'Gangster', 'Murder at Christmas', 'Pregnant', 'Winner', 'Amy', 'Party', 'Neig..
BAFTA winning comedians Lee Mack and Tim Vine star alongside Sally Bretton (Green Wing, Channel 4) in the hilarious, gag-filled second series of the hit Royal Television Society and Rose d'Or award-winning BBC sitcom Not Going Out. 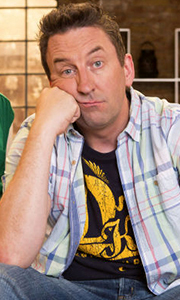 Meet Lee (played by Lee Mack), a man who has a problem. His flatmate Kate has moved out for good and his best mate and landlord, Tim (fellow BAFTA Award winner and stand-up, Tim Vine), has put the apartment u..
BAFTA award winner Lee Mack joins Tim Vine, Sally Bretton and Katy Wix in the highly anticipated fourth series of the hit Royal Television Society and Rose d’Or award-winning BBC sitcom Not Going Out. Happy-go-lucky - but entirely hapless - Lee (Lee Mack) is still desperate to win the affections of his flatmate Lucy (Sally Bretton, Green Wing). But despite last year’s Christmas kiss, it’s still not plain sailing; and it’s not just Lee’s..
BAFTA Winning comedians Lee Mack and Tim Vine star alongside Sally Bretton (The Office, Green Wing) and Katy Wix (Torchwood, Outnumbered) in the hilarious fifth series of the hit Royal Television Society and Rose d'Or award-winning BBC sitcom Not Going Out. Series Five follows Lee as he gets himself into all sorts of scrapes and sticky situations in his eagerness to please and impress the object of his affections, Lucy (Sally Bretton). ..
All ten episodes from the seventh and final series of the award-winning BBC sitcom starring Lee Mack. In this series, Lee (Mack) and Lucy (Sally Bretton) are introduced to their new neighbours Toby and Anna (Hugh Dennis and Abigail Cruttenden), Lee joins a boxing gym in order to impress Lucy, and Daisy (Katy Wix) goes on Pointless. The episodes are: 'Mugging', 'Christening', 'Donor', 'Anna', 'Pointless', 'Alcohol', 'Surprise', 'Plane', ..